The mission of Housing Forward is to transition people from housing crisis to housing stability. Housing Forward is the only social service agency in west Cook County with a comprehensive "housing + services" solution for transitioning individuals and families out of homelessness. Over the past 25 years, we have developed a unique, integrated approach that to date has transformed the lives of more than 15,000 people. Our solution is comprehensive and long-term, not just a quick fix, which benefits Housing Forward's clients and also the communities in which we operate. Click the pie pieces for program details. Financial Assistance to address an immediate crisis regarding housing or utilities. Referrals for urgent and basic necessities. Client Counseling to develop a plan of action to resolve the crisis situation. 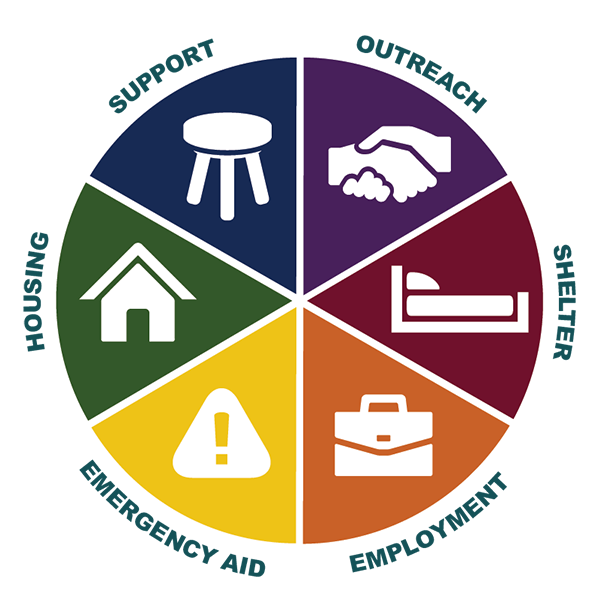 Shelter Diversion services include assessment and linkage to resources as alternatives to the emergency shelter. Basic Budgeting sessions to educate clients on how to create a plan focused on financial stability. AfterCare for Housing Forward graduates to improve housing retention and prevent their return to homelessness. More information about Emergency Assistance, eligibility and document requirements can be found here. Outreach & Engagement connects the most service-resistant homeless persons - living on the streets and in the PADS Shelter - to resources and programming. In-reach: a team of Outreach & Engagement Specialists assigned to the PADS Shelter to connect clients to services and housing and who maintain a case load for clients considered chronically homeless. Street Outreach: a team of Outreach & Engagement Specialists assigned to finding, engaging and connecting with persons living on the streets, in their cars, or other places not meant for human habitation to provide basic needs (food, water, clothing) and a connection to services and housing. PADS Shelter provides immediate, temporary crisis response for 40 to 70 persons per night from mid-September to mid-May. Transitional Shelter for up to 15 persons per night includes case management, support group activities and life skills training from June to mid-September. Supportive Services address a gamut of service needs. Basic needs (showers, laundry, lockers, phones and a physical address to receive mail) available at our year-round Support Center. Life skills and wellness classes. Case management to move clients' focus from survival to self-sufficiency including access to enrollment in entitlement benefits & employment resources and the Health & Wellness program - an interdisciplinary model of providing comprehensive medical, mental health and substance abuse services. Career Passport is an intensive group program for clients who are committed to resolving their long-term barriers to employment. More information about our Employment Readiness program can be found here. Open Door Housing - long-term housing plus services for individuals & families who are homeless and have a disabling condition. Dedicated units for veterans and persons who are chronically homeless. Rapid Re-Housing - for individuals & families who need immediate but short-term services to return to stability. Transitional Housing - rental assistance and services for up to 24 months for veterans.